You are here: Home / News / Lebron James: Rare Champ in Black Financial Independence. Lebron James: Rare Champ in Black Financial Independence. 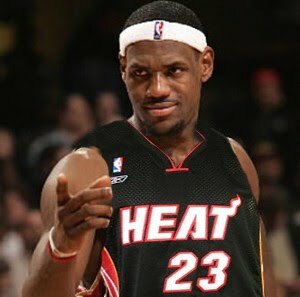 (ThyBlackMan.com) Lebron James now has the ring he’s been seeking for a long time. But there is another way in which he stands out from the mass of Black athletes: he is harnessing his own financial prowess instead of passing it all across to the white corporate establishment. Most of us do not understand that there is a game behind the games we love to watch: Professional basketball and football along with college basketball and football are all multi-billion dollar markets. My question to us is: Who is benefiting from all these billions? Yes, the players are getting paid millions now, but who is really benefiting and taking in the lion’s share? THE OWNERS. Out of all sports, how many Black owners are there? None in baseball and football, and only one in basketball. So, the white establishment built around sports and entertainment is making billions and billions and billions off our labor – and free labor in college. Does this sound familiar? Only white slave owners, perhaps, had a better setup for themselves! I will say this: a few of us are getting wise to the game. Lebron James has his own company now, the LRMR Marketing Company. Mr. James is doing the right thing: He did transfer a lot of wealth away from himself, but at least he realized his value in a very short period, and can now profit from it, instead of other people making the lion’s share off of his hard work. Apparently, he is getting good advice from people that know their stuff and care about him. By contrast, consider the case of Michael Jordan: an article in Fortune magazine in 1998 shows much money companies had made off of former NBA superstar Michael Jordan. Now let’s keep it real: what is the percentage of Black people who read Fortune magazine? Most of us did not find out that a number of companies made at least a total of ten billion dollars off of Mr.Jordan – and that was a low estimate. Nike alone made billions off Mr.Jordan, and is still making money today. You would think, based on this article, Mr.Jordan should have been the first Black billionaire. But in my opinion, he didn’t know his value or what he was worth to the people he endorsed and made money for. The people who advised him may not have known (or cared) to help him realize his value to himself or his own people. From Michael Jordan to Lebron James, the movement of a large portion of Black-generated wealth almost completely to the white establishment is still going on, and will continue until we wake up and change it. It is time for us to move beyond fans, players, and endorsers of other people’s products; it is time for us to become owners and producers of our own products so that our star athletes can endorse and support us. Lebron James has already made himself the champ of his own financial future: what are we going to do? This is an important article just now, with our people about to show mastery at the Olympics in a few weeks as well… we need to consciously move away from the whole mindset that we exist to generate wealth for other people and start bringing that wealth back to the community. I just watch the process and think to myself, “It’s like mental slavery.” Thanks for pointing up a brother who has found some measure of freedom! My aplogies to the commenters. The people I mentioned are not the best examples of ownership. As sister hoodgirl said they are still exploited. My point was that ownership and knowing your value are keys to financial success. I guess the best example of what I’m talking about is Bob Johnson, founder of BET. Sankofa I think you’re wrong about him. He owned the majority of shares of BET. That’s why when he sold the company, he became the first Black billionaire. This is why it’s so important to become producers and control what we produce. Lebron seems to have a good head on him. Hope he stays focused and always educate himself about money and finances.Our Black Athletes,should educate themselves about money and finances,so that they don’t lose their wealth,and become victims of bankrupcty. @Orlando, yeah it seems like he and his team were ahead of the game at such a young age. maybe that’s why the mainstream media keeps dogging Mavrick Carter and the rest of his team for giving Lebron “bad” advice? At this stage in my life, i want to gie us the benefit of the doubt untill we really mess up, then chastise them for failing to do what every other ethnic group continually does, which is to take care of each other first. If you contrast this artiicle with a previous one, on here, about our terrible sppending habits, you will see that we have a long way to go, before we can feel good collectively about wealth in our community. Please read article from 6 years ago…. by Latesha Williams from Black Enterprise, who seems to have outlined it perfectly. This is all i was asking for….but this is 6 years ago…so i guess it skipped a generational GAP, and looks like he was investing in real estate 6 years ago SANKOFA….thank you for the GAME behind the GAME explination. would be nice to update information…im sure they are doing more than this. I agree, OWNERSHIP is the key to financial independence. However, JZ, P Diddy and Russell Simmons are millionaires hired by Corporate Execs to extract billions from our community leaving it in further financial and moral distress. Neither of these Clowns owns a music distributorship or a bank although brothers and sisters are walking around with a rushcard that Russell receives a kickback of the usurous fees charged by predatory banks for his role in the conspiracy to keep our community in financial ruins. I guess you didn’t get the main point of the article. We as a community don’t know our value. Who do you think made this country great? It was our ancestors labor and genius that put this country on the map, and still today. From business to science, we continue to give our all and only receive left over scraps because we still don’t know our value. The game inside the game is ownership, producers rather then just endorsers and consumers. A buying power of a trillion dollars means nothing if you’re spending it in every community but your own. My point is if people who don’t look like are bragging about the billions they made off you, when you only made millions, that’s not knowing your value. But Lebron is headed in the right direction in starting a company he can use to create opportunities for his self.If he continues on this path and has the longevity, he has the potential to become a billionaire. If you don’t agree that ownership is the key to financial success, ask JZ, P Diddy, Russell Simmons. When we finally unite as a people, we can all achieve financial independence and happiness. Just a quick note. Neither Michael Jordan currently or that BET guy before him were ever in control of their interests. They were/are at best majority shareholders with money the borrowed from other Caucasian people. Just like magic is called a owner of the Lakers, but 7% doesn’t qualify one for anything except door keeper in a billion dollar industry. Orlando, not only did you unintentionally or intentionally miss the point of the article, but you are engaging in the defeatist attitude that many of us engage in (present company also at one time) of casting greater expectation on successful people from afar, without getting all the facts. Also Caucasian wealth is generational and their tentacles is far reaching. Please don’t expect Lebron to just arrive and do every or much of any of those things you mention. He is still in the process of controlling his brand (very important) and consolidating as much of his personal wealth as possible. His wealth is not generational and neither is the training he would have had in order to embark on such grand and ambitious path in one swoop. Michael Jordan and his people could not do….please explain the GAME behind the GAME. Is Lebron’s firm buying real estate, art, investing in America, investing in Europe?, Board of Directors on any Fortune 100 companies (US or ABROAD), purchasing a Fortune 500 companies, or purchasing any natural resources in Africa?…are they becoming major players in politics? please explain. All black men should read “40 million dollar slaves” which is a book about the ignorance of black athletes and how they blow their fortunes away in a few short years. There’s a section in this book, or a follow up book, on Michael Jordan and how he had opportunities to do great things for the black community but decided to be a sellout/sambo for white business establishment.